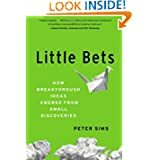 Little Bets by Peter Sims is a fantastic little book about experimental innovation and creative thinking. The subtitle actually reads: “How Breakthrough Ideas Emerge from Small Discoveries” I put this book off for over a year before finally tackling it and I immediately realized my mistake. The book is a collection of ideas on everything from launching new products, design, to creative warfare. There are a lot of little nuggets in this book and I’ll do my best to bring them to the surface. But first a personal story. I work as a business intelligence analyst/developer, which is really a fancy term for analyzing business data, looking for patterns and then designing dashboard reports for business users such as VPs, directors, managers, to consume the data and make better decisions. My most recent project required that I build a data mart for tracking our sales pipeline leads better. A data mart is business data that is in a very specific format which makes it easier to query and build reports on. I had began reading the definitive guide to building data marts and I couldn’t wait to try it. had met with the VP in charge of the project and had a very good idea of the requirements, down to specific deliverables. Two weeks into the project, I was still trying to come up with a high-level concept for the way the data was laid out that would accomplish all my goals at once. I wanted the design to be perfect right from the start and I wanted everything to flow from there. In other words I was stuck! The book starts out with a bold principle: “Genius ideas never spring into people’s minds fully formed. They emerge through a process of discovery and experimentation” It’s a bold principle because traditionally we’ve been trained to think in terms of top-down design; first come up with the idea in our mind then take action. That’s exactly what I was trying to do! I was trying to come up with a brilliant design first and then build the reports after. Only then did it dawn on me that the process I followed to build the project on sales (item #2 above) was the same process of creative discovery this book was talking about. It was only after building several purpose-specific reports all based on the same, common data set that I was able to see the patterns and be able to abstract the data to an all-encompassing, all purpose data mart. I think that’s very telling of the mindset that has made Pixar a million-dollar successful animated films empire. It’s very important to actually put stuff out there and get feedback especially from the actual users of your product. That’s the key to the iterative method which stands in sharp contrast to the old-school “waterfall” planning method. This method which grew out of the way manufacturing and construction industries handled their projects, has turned out to be disastrous when applied to software engineering. How entrepreneurs think was the subject of a study and paper by professor Saras Sarasvathi. In 1997 she set out on a journey across 17 US states to meet with 30 founders of companies ranging in size from $200 millions to $6.5 billion dollars and to find out what makes entrepreneurs entrepreneurial. She came up with a theory she calls “effectual reasoning” which differs quite a bit from the causal reasoning we’re all taught in school. “Effectual reasoning is all about execution. Plans are made and unmade, revised and recast through action and interaction with others” These entrepreneurs don’t like to do traditional market research such as focus groups, targeting, etc. Instead they prefer to talk to customers and find out what they want. They take product ideas and half-baked prototypes directly to customers to see if the idea works. The Affordable Loss Principle. While managers try to analyze the market and choose targeted segments to launch new products, entrepreneurs try to reach the market quickly with as few resources (time, effort, money)as possible, as well as taking a small enough bet that you can learn from it without it costing you the your entire savings. If you have ever seen the show Shark Tank, one of the saddest moments in the show is when a prospective entrepreneur has spent years and years and probably drained their savings to build a product only to see it rejected because they never took it to market. The Strategic Partnership Principle. The successful entrepreneurs in this study all prefer to build strategic partnerships rather than focus on competitive analysis. They start these partnerships as soon as they have customers, in fact customers are considered partners right from the beginning. The Leveraging Contingencies Principle. This is the ready-fire-aim approach to building products. The ability to take an unexpected turn of events into a profitable business is at the heart of entrepreneurship. Many great companies (Google, Microsoft, Apple, etc) were built from leveraging contingencies. What I found both interesting and fascinating is the fact that Little Bets has an entire chapter dedicated to one of my favorite books about psychology. This other book is called Mindset: The New Psychology of Success by Carol Dweck. Dweck is one of my favorite researchers in psychology today. Her book tackles the theory of the growth mindset vs. the fixed mindset while applying it to a variety of fields from intelligence and learning to self-help. She found while studying students that some of them would prevail in the face of challenges while others would falter, give up or not even try. Going deeper, she found that the key was their attitude towards learning. The students who were able to overcome difficulties thought about learning from the perspective of growing their abilities and intelligence while the ones who gave up or didn’t try thought about learning as having a fixed intelligence and either proving or disproving their own smartness. This is one of the things I’ve always battled with, having been praised my whole life about my intelligence and innate talents and abilities. I’ve always wanted to grasp things immediately and understand them fully. Failure to do so, meant I was not smart so I’d avoid those situations as much as I could. It wasn’t until I read Carol Dweck’s book that it started to make sense. Little Bets looks at this idea from the perspective of how we view failure. Here’s a little table exploring the two mindsets. Fixed intelligence/Innate talent Growing intelligence/Learnable Talents. How do you change your mindset? Carol Dweck says: “A person’s mindset can strongly be influenced by what they think is most important ability or effort” Once you become aware of your mindset, you can start to influence it by paying more attention to the effort you put into it vs. thinking about your ability to do it. It is very important to praise effort in children early on rather than ability because that’s how you build the growth mindset. This is just a small sampling of the goodies in this book and highly recommend you read it. This entry was posted in Uncategorized by Ergest Xheblati. Bookmark the permalink.